Everyone knows sweet little Caiden! This handsome little boy is the famous baby of my rainbow pregnancy announcement I did for this family and the adorable baby boy I did the newborn rainbow image of too! I saw Caiden for his 6 month milestone session and hands down, it's my favorite so far! 6 month sitter sessions might be my favorite. The babies are full of smiles and personality. I am to capture great images for their families. Caiden and his bright blue eyes did not disappoint! I truly love all his smiles and facial expressions. I'm so glad mom loved his gallery as much as I do! One of my favorite images is the close up of his sweet face wearing the blue and cream striped outfit I found at Janie and Jack! Caiden I can't wait to see you again in a few short months. How has it been 6 months since you were a newborn baby boy? I first met Emmett for a family session in October, and just saw him for his 6 month session! Emmett you are so adorable! Those cute little smiles and bright eyes lit up the room. You're such a big boy trying to sit all by yourself! Next, you'll be crawling and then walking. I hope time doesn't pass too fast though. You sure are surrounded with lots of love from your sweet family!! I always enjoy our time together and I can't wait to see you again!! I would love to capture memories for you and your family! Please contact me today for best availability. Check out my work on Facebook too! At 25 days, Miss "Kate" was a dream!! She slept almost her entire newborn session! 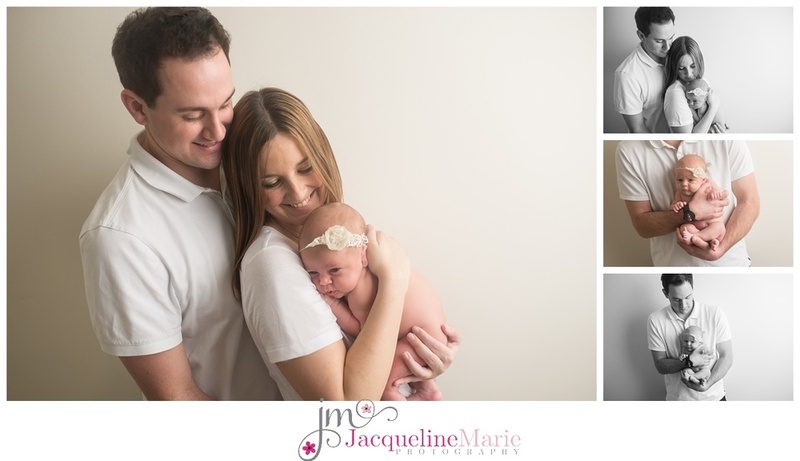 We were able to get some great images for her family!! I'm in love with all these neutral images. So precious and timeless. I used to work with Kate's mommy, so it was an honor to be able to do her newborn session! You can tell she is so loved by her family! Her session was special because grandma and grandpa also decided to come along and watch her be a model! These sweet babies grow so fast. Enjoy these early moments with her mom and dad! I can't wait to watch her grow and document these priceless memories for you. Providing services to families from all of Central Ohio- New Albany, Gahanna, Westerville, Dublin, Hilliard, Grove City, Lewis Center, Powell and more!